Map publisher and print seller Robert Sayer traded from Fleet Street in the latter half of the 18th Century, first under his own name, and then under the joint imprint of Sayer & Bennett. 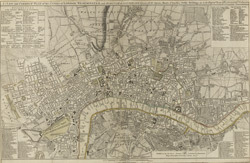 This is a later edition of Sayer & Bennett's 1781 map of London. Coloured outlines appear along the boundaries of the London Wall, Westminster and Southwark. References tables appear in all four corners, listing public buildings, churches and the parishes within the Bills of Mortality (those parishes who reported deaths to the central London government). Open land, such as parks and gardens, is highlighted in green.